Of all the things I’ve developed or helped develop over the past few years, the PS Trench Coat was one of the most satisfying. That was partly because it seemed to fill a particular niche for people, but also just because it was outerwear. Outerwear is one of the most exciting things to buy as a man, largely because it is so transformative. It changes your whole silhouette, and often dramatically: big lapels, long length, lots of lovely cloth wrapped around. It’s also, therefore, one of the most exciting to develop. And it has been great working on this, the PS Bridge Coat, with Private White VC over the past eight months. The elevator pitch was simple. 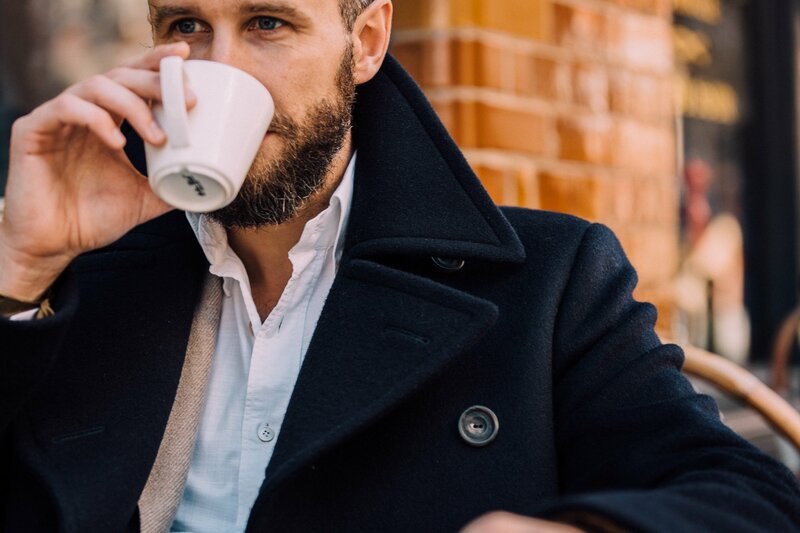 Given how diverse and fluid modern wardrobes are, pea coats are an incredibly useful piece of menswear. 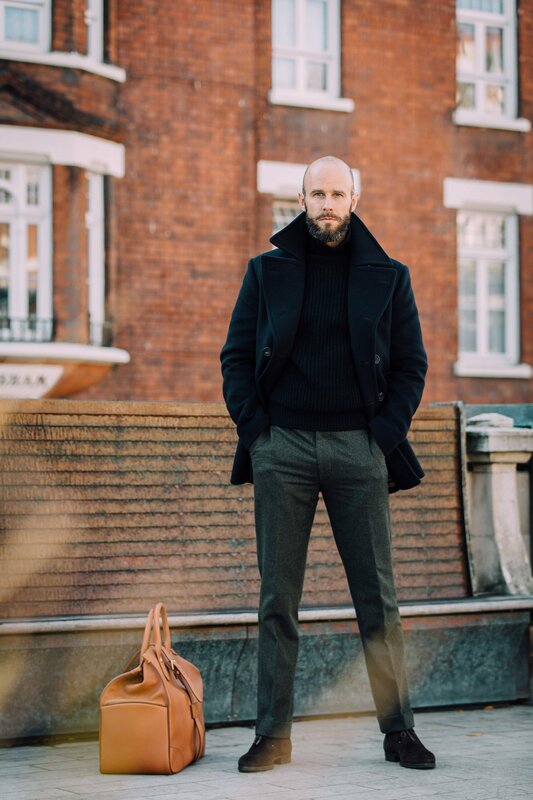 Few other things are versatile enough to go with smart jackets and trousers, but also with jeans and knitwear. But they’re rarely designed with tailoring in mind. 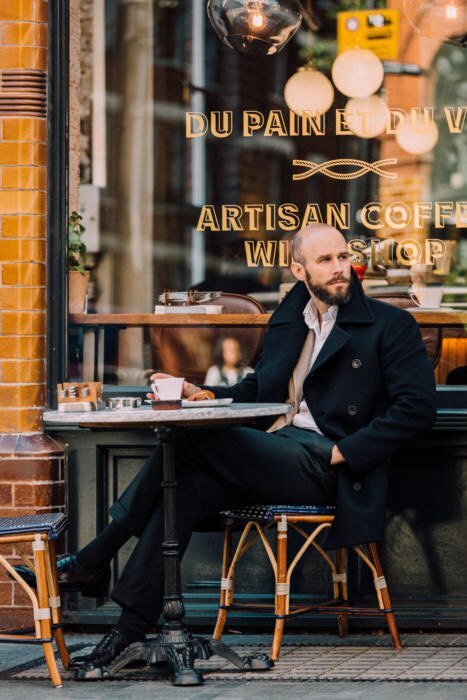 Pea coats are usually too short to cover a traditional suit jacket, and are often too small in the shoulder and sleeve. So we made a version that corrects these points - suited to the Permanent Style reader. That they can wear with their oatmeal blazers as well as their shetland sweaters. But as well as adding 2.5 inches to the length, we put in some traditional design details. For as great as a lot of modern pea coats are, their designs are quite basic. Most importantly, we changed those two lines of buttons up the front. These are usually straight and square, which is pretty dull. They have been replaced them with a sweeping, flattering line more usually seen on overcoats - or on the naval officers’ equivalent of the pea coat, the bridge coat. Those two lines (as you can see below) narrow slightly from the hips into the waist, which is flattering in itself, but then bow dramatically outwards around the chest, creating an impression of strength - an impression accentuated by the line then narrowing again at the collar. These two sweeping lines are only seen in full when the coat is buttoned all the way up (which of course it is able to do - like any good tailored coat). 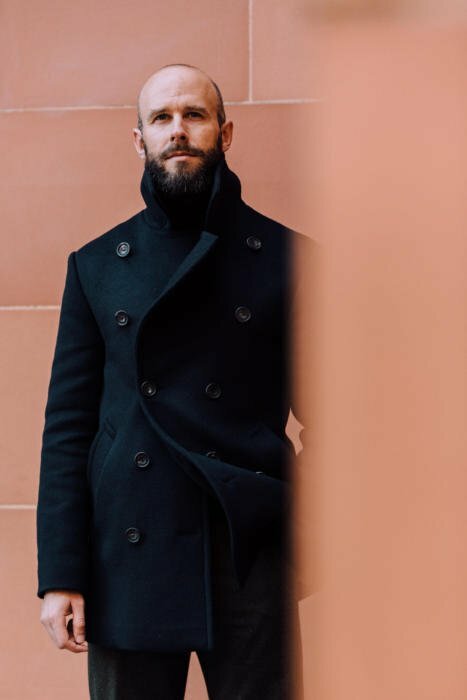 But even when only partly buttoned, this curving front edge adds character to the coat, creating lapels that curve outwards too - more like a double-breasted jacket than a normal pea coat. Perhaps most importantly of all (for me), the materials are luxurious but understated. So distinctive as that sweeping front edge is, the effect is subtle because the buttons are dark and matte: unpolished dark-brown horn set on deep navy cloth. It hopefully achieves my usual aim with clothing: being stylish and elegant, but in so subtle a manner that no passer-by can point to its cause. He may suggest the collar, or the cloth, but he would be wrong. It’s all about the front edge and those buttons. This is perhaps a minor point, but I also wanted to echo the Savile Row style I have always loved by using the same buttons they do. So the horn is not shiny, as the Italians use, or even really matte, again as the Italians sometimes offer. Rather, it is completely unpolished: often described as ‘dull’, though it is hardly dull to me. And they will be two-hole. Again, a small thing, but it’s a style of button rarely used in menswear outside Savile Row. Perhaps it seems a little more refined. Or perhaps I’ve just been looking at buttons too long. In the same way the buttons are a step up in luxury, so is the cloth. I love hard, stiff wools or melton in a pea coat. But over tailoring it’s a little too rigid. So for the PS Bridge Coat we picked a wool/cashmere mix. 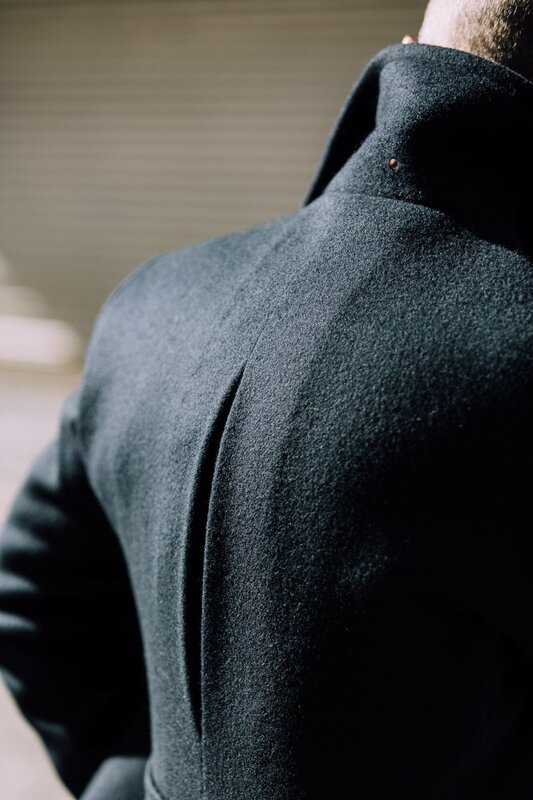 At 20%, there’s enough cashmere to feel luxurious, but enough wool to make it suitably robust for an every-day coat. And the weight (620g) makes it versatile, if not heavy enough for the coldest winters. Oh, and a point I particularly love: the pockets are lined with 100% cashmere. Because I use pockets a lot, and there’s nothing like putting your bare hands in a cashmere-lined pocket on a cold day. It’s the kind of thing most brands would never bother with, because it wouldn’t help sell the coat off a hanger. The coat has two in-breast pockets, with the left-hand one placed between two buttons so that, when the coat is fully buttoned up, you can still access it by sliding your hand in between them (shown in two stages above). There is a nice big poacher’s pocket on the inside-left hip - so even if you have your hands plunged in both the outside pockets, there is sufficient room inside to carry everything. There are two jigger buttons on the inside of the coat. One at the waist, as standard, and one at the neck level. The latter enables you to fasten one layer of the coat across your chest, keeping you warm, while keeping the other open. Style-wise this arrangement avoids looking too buttoned up, but it’s practical at the same time (below). In the back there is a central box pleat, to help a little with movement when wearing a jacket underneath. There’s then a half belt, merely for show, with a raised edge that echoes the pockets on the front. And below that, a central vent that can be fastened with two button tabs. The tabs are nicely hidden away inside a fold of the vent, rather than sticking out (image further down). And last but certainly not least, the Bridge Coat has a lovely brass-coloured lining, which I picked to look luxurious without being showy. A traditional bridge coat - by the way - would be rather longer than this, ending just above the knee. But it’s a helpful term to indicate our version’s longer length than a normal pea coat. And a bridge coat would have been worn by the officers on board rather than general seamen, so it fits with the higher-specced PS Bridge, with its cashmere-mix cloth and sartorial hardware. 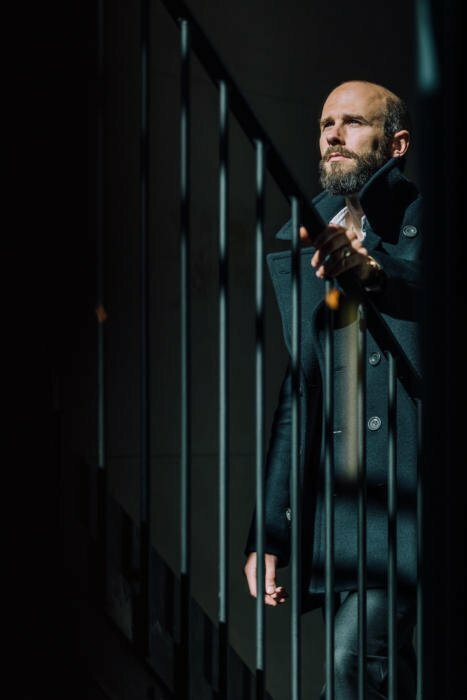 The Bridge Coat is available to buy now on the Permanent Style shop here, priced £850 (including VAT - displayed price does not include VAT until destination is selected at checkout). There are 50 pieces in four sizes, from Small to Extra-Large (though several have already been taken by those on the waiting list). You can see the measurements of the coat below, and I always recommend checking these against a coat you already have as the best way of ensuring the right fit. However, as a rough guide the Small is equivalent to a normal size 48 chest (in European sizing; 38 in English), 50 for Medium, 52 for Large and 54 for Extra-Large. For those used to Private White VC sizes, a Small is a 3, a Medium is a 4, and so on. I am wearing a Medium in the pictures here. I'm usually a 50 in ready-made tailoring, sometimes a 48 if it's a boxy cut. I'm 6 foot tall and wear a 32-inch-waist trouser. 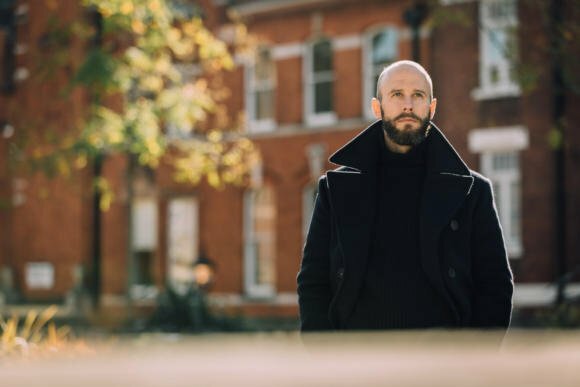 With the Trench Coat, I found I was between sizes, with a Small fine except over a jacket with the lining, and a Medium a little big over knitwear without the lining. With the Bridge Coat I’m a solid Medium. It helps that there isn’t the complication of adding or removing a lining, and that the shoulders have the structure to fit different sizes of physical shoulder underneath. Like the Trench Coat it is cut relatively slim - not skinny by any means, but also not the straight and boxy style of traditional pea coats. The Medium is long enough to fit over all my bespoke jackets, the longest of which have a 32-inch back length. The advice from Private White in comparison to the Trench Coat is as follows: "The trench coat has a traditional style and is made with about 6 inches of room between the wearer's measurement and the garment. This is to allow for multiple layers underneath. 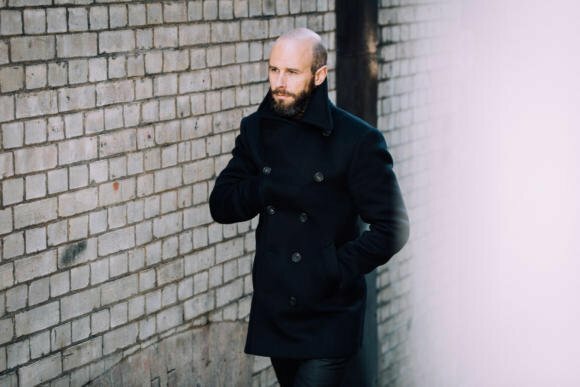 "The Bridge Coat has more fitted style with only 2 inches of room. It allows for a light to semi-weight jacket underneath or a medium-weight jumper. However the cloth has much more give so it allows comfortable movement despite the narrower fit. And in comparison to other Private White garments: "This is formal coat so it shouldn’t be worn oversized; but if you are in between sizes then you should likely size up. To compare to our Manchester Pea Coat style the coat is about a half-size slimmer in measurement but has much more forgiving fabric." The measurements are below - in centimetres, on a flat coat going across or up and down, rather than the circumferences. The length is fairly easy to shorten, but make sure the tailor is happy altering the vent at the back. That vent also makes it very hard to lengthen, so that wouldn't be advised. The coat can easily be taken in at the waist, with three seams to work with. But I wouldn’t recommend doing so by more than 3cm on each side. It can also be let out, up to around 2cm on each side. As readers will be aware, the Bridge Coat has been delayed rather from its original launch date in October. We decided to put it on sale now as so many readers have been asking about it, but the coats will only be ready early next week - so please be aware shipping will not be until next Wednesday onwards. Thank you. You can follow the discussion on Introducing: The PS Bridge Coat by entering your email address in the box below. You will then receive an email every time a new comment is added. These will also contain a link to a page where you can stop the alerts, and remove all of your related data from the site. Great Looking coat! However, I have two questions – was it a strategic decision not to make the back-belt adjustable and is the offer still kept in accordance with the PW pricing manifesto (I understand the more luxurious materials, but still)? Thus being said, looking to buy one – I am a Size 48 in suits, would you suggest getting the Small or the Medium sized one (asking because of the comment, that this one is rather of a snugger fit that the usual PW Medium size)? Yes, I don’t particularly like an adjustable belt on a shorter jacket like this. Yes, it is still within the pricing manifesto. Sizing wise, I’d probably say a Medium, yes, but worth checking some of the measurements to be sure. Simon, will PW do alterations through the Duke Street Store? Excellent – All ordered so fingers crossed the fit works out.I was planning to order the regular PW pea coat but the line of those buttons just blows it out of the water. Is it still covered by the PW lifetime Repair? Do you know if PW will do a MTM version of this for extra (as they do with their other jackets)? Also, will they be carrying any in store to try, or is it online order only? Excellent news – your lanky readers salute you and Private White! As a general comment I love that PW offer this (as indeed do Luca Faloni for knitwear) and think it is a shame that it doesn’t get wider coverage. It makes such a difference for those of us of a more unusual shape. Luca Faloni does MTM knitwear? Whoa. 1. Any plans for another colour? 2. Why no XS/ Size 2 this time? Will PWVC stock have XS/Size 2 or can you get some in? Is this likely to be a one-off run, or will it become part of the Private White VC collection? I can’t predict the PWVC collections (they do also have their own pea coats) but it will be one we’ll get back in – like the Trench Coat. Marvelous looking coat indeed. If it will be a re-occuring item like the Friday Polos, I’m sure I’ll get one at some point. I have been looking forward to your bridge coat since your first teaser, but I think a size S(3) would be to large for me? I am 5,7 and normally wear a size 44 or 46 in OTR suits. So I hope in the next batch you would include a XS. Yes, I think you’re probably right. We’ll look at doing XS next time, but do also talk to PWVC, as they may have some XS when they get it in. Congratulations on another wonderful and thoughtful collaboration piece. I got your PS Trench Coat in XS/2. I’m 5 ft 7″, 28.5 inches waist. Do you reckon a size small bridge coat would fit? I think it would likely be too big, but it is worth checking the measurements to be sure. Small and XL are the only sizes left! Thanks for your reply. So my best bet for an ‘XS/2’ is to email PWVC and enquire? Lovely coat, i have previously bought the trench coat size 3 and other PWVC pieces size 3. I’m not sure about the size for this one, shoulders measurements seem a bit small for size 3, also i note you have the chest measurement for size 3 as 50.5 inches is this correct? If you’ve gone for size 3 and it’s worked well, then I’d go for that. But if you were between sizes, I would suggest sizing up. Feels like I am missing something given no one else has asked yet… I see the fabric is 80/20 wool/cashmere but couldnt spot the weight of the fabric? How warm would this wear (ignoring the length difference) from the PV peacoat? No you’re right – I’m actually just checking that. Thanks I will try to contact PWVC and hope they got a XS? Your coat looks fine by the way! Really nice job, Simon. Was hoping for XXL, but maybe in a future collaboration! A lovely coat but I’m afraid I need a coat reaching nearer to the knee for a cold Canadian winter. This looks like a really well thought out coat and it just so happened that I’ve been researching for a good pea coat for the last couple weeks! I’ll have to pass on this though. I think some other commenters have already noted this but I hope you’ll consider XS sizing in your future collaborations/batches for existing items! I feel like a burgeoning market especially for us men of asian body type and I think XS sizing may better suit those with a lanky frame or below 5’8″ in height. Oh well, I think anyone else whose in that demographic probably already knows the all-too-familiar feeling of finding something that’s fantastic and good value but simply too large. Looks amazing! How is the water resistance? Does they Cashmere impact it very much? Great coat.. As I’ve decided to forego the Northhampton factory visit, Any chance to have a look during my London visit next week? Looks lovely, I’m a bit confused by the sizing though. For example the chest measurement for the large on the bridge coat is 56.5 inches but for the PWVC pea coat, the same size chest measurement is 46.5 inches – yet the bridge coat is supposed to have a more snug fit? Sorry if I’m missing something. I find this confusing as well. I think what the sizing is actually showing is the lying flat measurement across in centimetres. That makes much more sense to me than the circumference in inches. Also explains how one can have a length that’s over 80.4 and up (80.4 inches would need a 7 foot tall person)!! Simon, would you be able to clarify please? OK, so it turns out I had this slightly wrong from PWVC. The measurements are different to their site – these are in centimetres, and are flat measurements across or up and down the garment, rather than circumference. Congrats Simon on a really well thought through and excellent looking piece. Sure to be popular. This looks like a very nice peacoat. Nice job, But, I would prefer a true overcoat for tailoring. Plus, the market is saturated with peacoats every Fall/Winter. Not a criticism, but perhaps you could consider putting out a PS double breasted overcoat for the next project. I think it would be popular with your followers. Thanks Dan, and nice to know. Surely there are lots of DB overcoats in the market, though, while there are no longer pea coats like this one? I think the PS bridge coat looks very, very similar in style to the Drake’s peacoat (which I have and love). The Drake’s version is also of a longer length, though the fit, as you mentioned in the write-up above, does not really cater well to tailoring underneath. That said, I am really tempted by the PS bridge coat, the flaring buttons and lapel edge in particular are killer. The lighter but more luxurious material also a great differentiating point. 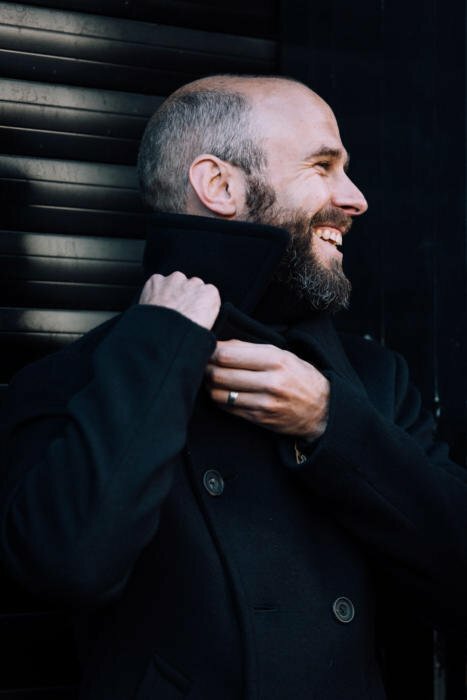 I have been envious of the lines of your bespoke pea coat ever since I first saw the sketches, and this looks like a fantastic option to one day own — once I save up enough money that is. With regards to the lapels, is there any sort of canvassing or stiffening material inside? Hi Simon….how did the experience of your Gieves bespoke pea coat shape the design of this marvellous piece and are there elements you have both incorporated and changed in this design, through wearing the Gieves coat over a significant period? It did a little, but the basis was the Private White pea coat. The most obvious thing I loved from the Gieves one Davide made me was the line of the buttons, which are so lovely and make that front really dramatic but subtle. I very much like both your definition of elegance (subtle and hard to explain…) , the thinking behind the project , several details and the great pricing. I won’t go for it as I already have a decent bridge coat and there is something I do not like with the outcome for the buttoning. One question regarding the cashmere pocket lining: is cashmere not too fragile for it? What weight for this lining cashmere? It’s a spanking coat Simon. Perfect in many ways and an almost exact replica of the coat designed by yourself and David Taub (PS 2014) sans frogging. Some credit therefore due to Davide/G&H archive for co-design and evolution? Accepting that, you have in fact improved on the original. I can’t think of many winter 2018 items that are more suitable for addition to a man’s wardrobe. The improvements and additions: Napoleon pockets, poacher pocket, brass coloured lining, cashmere pockets etc. elevate this garment even further. One question, given the US and UK markets use inches why give two sizing refs. but no inches ref. (which you actually use in the article – i.e. 32 inch back length etc.)? I’m 5.7 and have a 31 inch waist but have broad shoulders for my height. My off the rack suit size is either 37 short or 38 short (American sizes), depending on the brand. Would a size small likely fit me? Presumably I would have to shorten the length a bit. (In America, a “short” garment is typically about an inch shorter in length than a regular garment, and about 2/3 inches shorter in the sleeves. On a related note, how much longer than a suit jacket should the cost be? I think a Small should be fine, yes, though you may well have to alter the sleeves (length is more a question of choice). Excellent coat. Do you happen to have a picture of it partially buttoned up (skipping the top two buttons) with the collar folded down? Would love to see the size and line of the collar/lapel in the way I would wear most often. I can see that XS has Bern added Noe, thanky. One last question – would you wear it as a regular peacoat with i.e (smart) chinos and a sweater? Hi Simon, will you be having a pop up store in the near future? The coat looks terrific, but I always like to try something on physically before buying. I must add that it looks one of the nicest pea/bridge coats I have seen. Hi Simon, given how quickly the XS and S sizes have sold out and other sizes are still available, will these XS and S sizes be prioritised in subsequent updates? Looks terrific Simon. Would be awesome in an olive green for next winter. There are so many p-coats in navy blue it’s hard to distinguish them. Just for reference Drakes also did a P-coat very similar to your Bridge coat a couple of years ago. It was an interesting collaboration with Makintosh and LoroPiana. Beautiful cashmere blend, navy on the outside and grey on the inside of the coat for a nice detail. It was cut longer to cover tailoring. Perhaps if your customers are not finding their size in your coat, maybe Drakes will re-launch their iteration which is virtually the same. Hi Simon – Is the Bridge available to be picked up in person? I live in the US but will be in London next Monday and was wondering if I can buy it on line and take delivery in person? I am a size 54-long…assume the XXL is the right choice? Probably that size, yes Chris. I’m afraid it won’t be available in person, no. As mentioned, the coats won’t be ready until the end of next week, and wouldn’t be in store until the following one probably. Sorry. What an absolute classic and a must for any thinking flaneur’s wardrobe. Just the sort of thing PS should be doing ! PW are a great company and your Trench collaboration with them was also outstanding. I’d love you to get together with them and design the perfect travel coat in corduroy . Simon, do you have measurements or sizing information for the XXL? Looks to be a fantastic design. However, it has been years since I have invested in a coat like this for one reason. Wind protection. It seems that no matter how tight the weave, or heavy the fabric, there never was a lining that prevented the wind from making its’ way through to my chest. The coats seemed to work best on sunny, calm days, with low humidity. Is there a lining to this, Simon, or will the wearer be relying on what is worn underneath to provide a wind – break? Would you consider this coat suitable for cold winter days? I live in Boston and am in need of a woolen winter coat, but am not sure if this would suffice for our colder days. Either way, beautiful coat. Thanks. It depends what you mean by colder Jonathan. In London it would usually be fine. In Boston or Scotland it probably wouldn’t, for the whole winter at least. Simon, This is a beautiful coat. I cannot wait for next week to receive mine. However, I want to do it stylistic justice so ….Could you please provide those new to such luxury a few suggestions for hats, scarves and gloves. I’ve seen the suede cap and green scarf on prior posts but those are not currently available and I wonder what else might look good: fedora? PS watch cap? Thanks. I wouldn’t wear a fedora with a style like this, but any beanie or watch cap would be nice (and of course my favourite is the PS one), or a cap as shown. Damn, got distracted midway through the order process and it was already gone by the time I came back! Any chance you’ll be getting more in large over the next few weeks? Stylish coat Simon.May I ask who manufactured the cloth or the name of the merchant? As for sizing,I take it you meant cms. not inches.Even so 53cms.on a medium chest looks to be too snug a fit.As for 17.5cms on a half shoulder I would have expected 24cms at least.Could you clarify. I don’t know the merchant I’m afraid Tom, but in any case it wouldn’t be available in cut lengths (for bespoke). I’m pretty sure the measurements are correct, but I’ll double check. Hi Simon,lovely coat.I’ve just placed my order.Do you know if the order comes with a garment bag? I know what you mean, though this is softer than most given the cashmere content. Also I would have assumed you’d normally be wearing more than just a shirt underneath, if it’s cold enough to need the coat? In that case a jacket or crewneck would help support the shirt collar? Hello! Guessing that your long experience in the fabric industry has provided you a wide range of knowledge on attempts at new weaves and material. Have you ever come across discussions which explore the viability of ballistic protective fabrics or lightweight aramid weaves that provide some measure of stab resistance? Like many of your followers I’m former military and know about heavy and uncomfortable body armor panels. But I was wondering if technical advancements in the fabric industry is vying to create protective material more viable for everyday wear. Not that I’m aware of, no. There has been discussion on posts before around kevlar or gore-tex though. Eg here. *Realized after reading your site that the 850GBP included VAT. I was confused as I thought you explained it slightly differently last time. I think that is the same pricing model as before, PWVC just seem to have a different process and don’t remove VAT for US customers. Disregard the last comment and thanks very much! Another great product. I am on the waitlist crossing my fingers. What are your thoughts about owning both a pea coat and a polo coat? Are they different enough to justify? If you were to get both would you go for navy? Just received my coat. It is beautiful. 1 – In the third picture (not including the picture in the title), are you wearing a jacket underneath the coat? I am curious what degree of taughtness when buttons you feel is okay when wearing a sport coat with this Bridge Coat. 2 – I noticed that the interior of the coat on both sides have buttonholes. What is this for? Is it purely decorative or are you supposed to be able to button the coat with either side on top? I have a couple other pea coats that do not have this. 2. There will be at least one buttonhole on the front edge of the right side of the coat, to button to the jigger button inside of the left. Maybe email if you want to talk about it more? My bridge coat has finally arrived.Hurrah!I thought that I would make a few points that might be of interest to other potential purchasers. Snug fit,even on a slim frame.I’m 5 10 tall,40 chest….bought a medium (size4).I will wear this coat with a sweater,a jacket underneath would be too tight for me. Nice buttons and lining.Very understated. All in all,a very nice coat.Well done to Simon and PWVC Good to see a British company producing a quality product. Agree on the cloth, and the snug fit. Unfortunately, despite going up one size from the trench coat and up a size from what I normally wear in outerwear, it’s too tight for me. So if anyone is waiting for a size 3/small, there’s one about to come back. Thanks, good to know. There’s a lot of people on the waiting list waiting for returns! any chance of doing swaps on returns? Medium for a Large or similar? Or will the people on waitlists get the returns first? One more comment.I’ve just tried the coat with a 16oz jacket underneath,surprisingly, it does fit! Received the coat today and it looks very good! However, as I am quite new to this, my question is regarding how the shoulder should fit. I have tried it on with knitwear, a jacket and the fit throughout the body is very good (5’8 and ordered size M). The sleeves would have to be shortened slightly, which is ok, but the one thing that makes me second-guess are the shoulders, which seem bit too broad and ruin the clean look. If I would go down a size, the shoulder could fit, but everything else would be too tight. Any suggestions? my Bridge Coat arrived yesterday. Cloth and fit are wonderful, I immediately fell for the cashmere lined pockets. No gloves for me! I can wear all sorts of knitwear underneath and also an unlined jacket. Wearing both a sweater and a jacket would work around the shoulders but makes for somewhat tight fit around my mid-section. Time to hit the gym ;-). The curved silhouette when fully buttoned is a very elegant feature. Well done, Simon. PS: A spare button and some sort of discreet “Permanent Style” label inside for future editions? A spare button is a good call, I’ll get onto that. On labels, I’ve never particularly wanted to, as it perhaps suggests that PS is becoming more of a brand? Interested to know what you think. I also always liked the clean look on Row tailors or the A&S Haberashery of not having any label inside. fully agree with the totally clean, non-label Savile Row look and this may indeed be an interesting option for future batches (if you can convince yourself and Private White). But the PS Bridge Coat as it is currently done has the same label as any Private White coat/jacket/garment. Which is not a bad label at all and you and me will know the difference…but your Bridge Coat is NOT just another Private White coat. Maybe an “inspired by Permanent Style” below the current label? Or inside one of the inner pockets? Speaking of labels inside an inner pocket: The label with the cloth description is attached in a manner that it reads “80% Wool, 20 % Cash” :-). Irrelevant detail but maybe of interest to you. I would second the spare button! Indeed, if you could sell some I’d happily buy them – while unlikely to lose one, I don’t think I could ever source them. And also agree with your no label ethos. Keep up the amazing work! Why Permanent Style and not Crompton or Simon Crompton? Permanent Style is the name of your mental aesthetic sphere. 1. Doesn’t cashmere outside in wool mix make to too fragile? 2. 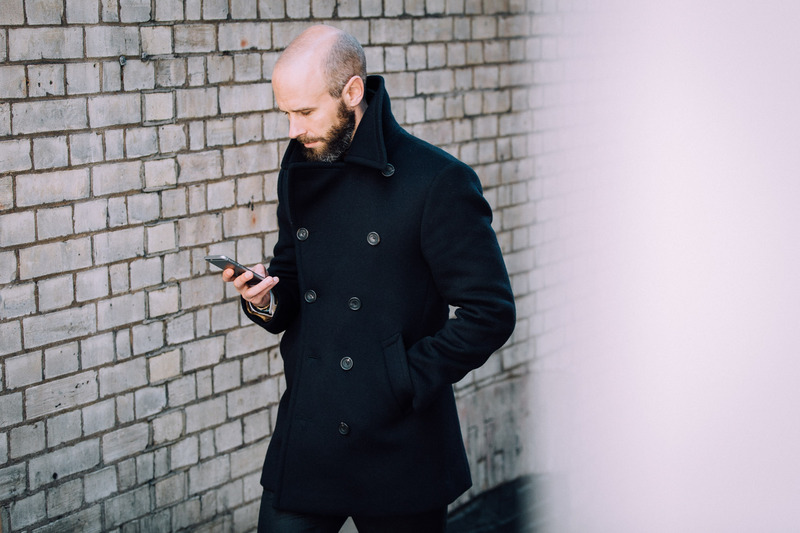 What’s the difference and advantage, disadvantage to Merchant Fox pea coat? 3. Would it replace a covert coat? 3 For warmth, yes it could. Could you please precise the color of the cloth ? black or midnight blue ? Great looking design Simon. I prefer a more relaxed fit and went with the standard Private White version and am happier with it than any other peacoat I’ve tried in the past. Speaking of fit – do you have any inclination or plans to test out PWVCs made to measure program? It would be an interesting comparison against the Gieves coat you had made a few years ago. Lovely coat Simon but I do wonder whether the peacoat (aka bridgecoat) has become well let’s say a bit yesterday. 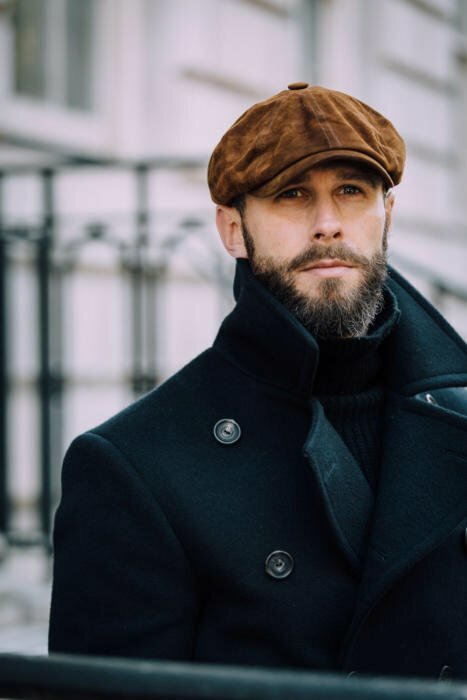 I may be slightly influenced by living in the US where the peacoat is quite ubiquitous and perhaps this should not really matter since you are carefully refining was is a pretty basic piece of outerwear. For what it’s worth, it feels like the new “it coat” for winter 2018/19 is in fact now the dufflecoat. Drakes and Ralph Lauren Purple Label both have hit the trend early. I suppose you can now start thinking about refining the duffle coat for your PS iteration next winter. Perhaps unrelated here but I for one can’t wait until overcoats go back to being longer and more elegant. 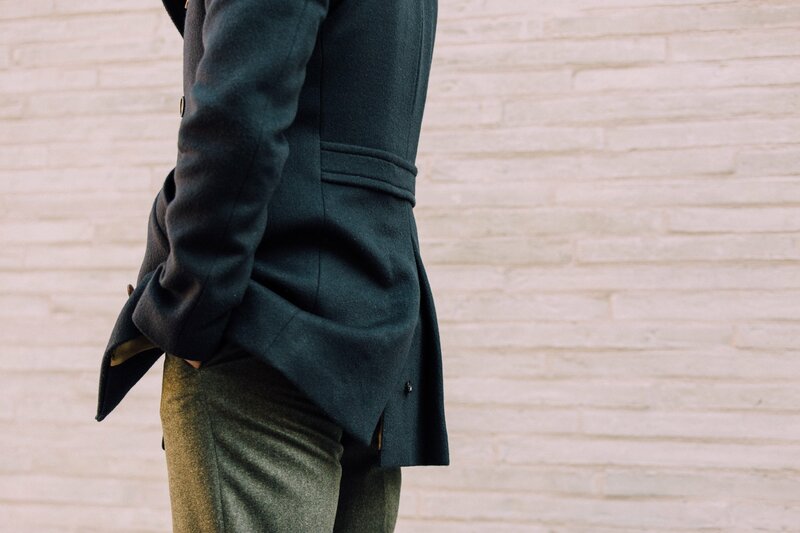 Today’s overcoats are simply to darn short – just a hint for your next design. Thanks Chris. I’d like to think the peacoat isn’t quite as trend driven as a duffle coat. 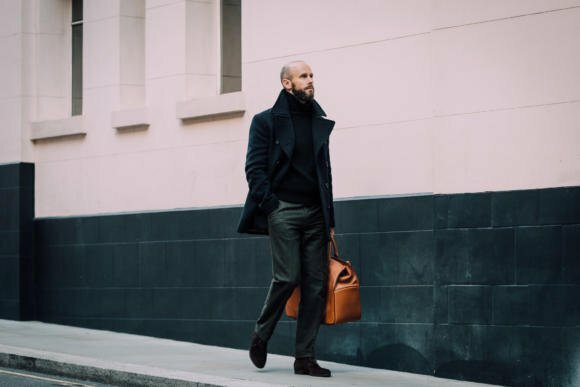 That seems to be one reason it’s so widely seen – it’s less showy and, for a guy that wants a short coat, it works much better than stupidly short overcoats or trench coats, as you say. 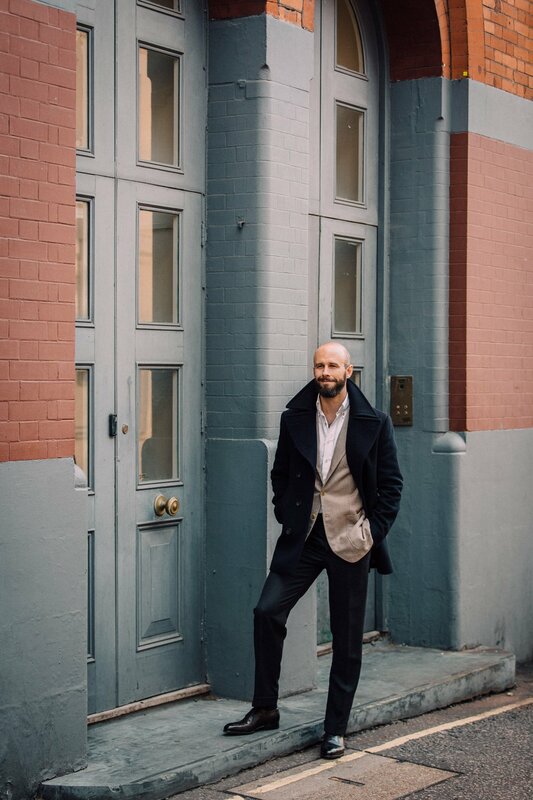 I’m going into Private White VCs London store front this morning to try on their pea coat (with the intention of purchasing one of the next round of Bridge Coats they’re manufacturing). One question for you, you indicate Bridge Coats are typically worn longer than this one is designed to. Will wearing this one longer fit with its silhouette? 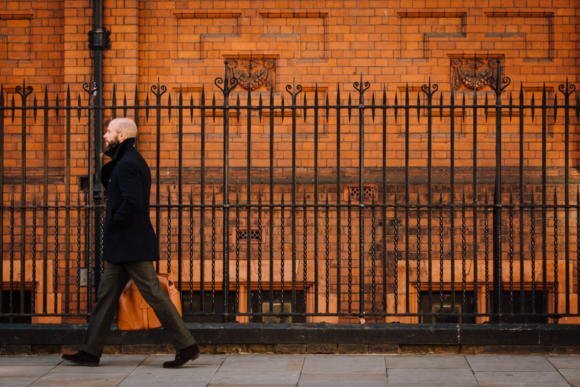 I’m 5′ 8″, wear a 50 (european) suit and 31″ trousers, as such the medium will fit through the chest and taper properly to the waist, but wear quite long compared to how it wears on you. Yes, I think that will work fine. And you can always take a couple of inches off the length at a later date if you want, without affecting the overall silhouette much. I am used to wear a size 48 ~ Medium… following size indications I purchased a Small : shoulder and sleeves are fitting well, but with a thin sweater when I button the coat it looks too tight and the back vent it looks “suffering” … it’s fully opened and not as “relaxed” as I would have preferred …. The way sizing suggestions are given might be improved, but this is the risk of e.commerce. Thanks Henry. Do let me know any specifics on improving the sizing info if you can. Lovely coat, great quality. However, I find buttoning up the interior jigger buttons nigh on impossible, particularly the top one. Came across this coat in PW VC Duke St. Absolutely gorgeous – bought it straight away. More stylish (and limited edition) products please. (1) Are there any issues with pilling? I recall some user on reddit mentioning they had issues with a PWVC cashmere/wool blend coat pilling badly. (2) I have a 41″ chest with a narrow waist, but typically wear a M/40R/50 in almost all brands except for Italian ones where I’m usually a 52 and Merz where I’m a 6/L. The 4/M measurements look quite tight, but I think I’d be swimming in the 5/L (especially since I’m only 5’10”). Am I crazy to think I might be able to fit into the 4? I do love the look of this, but as I have a shorter length peacoat for casual wear, this sees to similar and really what I’d like is an overcoat in a similar double breasted style for wearing with suits. You mentioned in a previous reply that these are already in the market, could you perhaps point to any examples as I have not found any? Thanks. Appreciate the fast reply, they do look nice but don’t have the dramatic broad lapels I’m looking for, akin to a British Warm or greatcoat. I looked at Crombie and New & Lingwood but nothing appropriate. Any other good ideas? When in late January do you expect shipping the coats for those of us who ordered in December? Looking forward to wearing it. I received the Bridge Coat mid December last year. A truly wonderful coat , versatile and a real pleasure to wear. Well done to both yourself and PWVC. Do you use a clothes brush or lint roller on it to keep it free from other fibers? Thank you Stuart, that’s great to hear. It’s obviously hard to tell just from a photo, but it doesn’t look too big to me – even perhaps pulling a touch in the chest. I’d leave it as it is. Just picked up my bridge coat at the post office and it’s really amazing, beautiful and feels great! But I also have a fit question for you, hope that is OK. I got the same size pw4 (medium) as you, I’m just under 6′ with a slim athletic build. So that makes me believe I can’t really go down in size and measuring my chest it’s about 100-101 cm). But then on the shoulders I have about 1-2 cm of the coat sticking out outside the end of my shoulder bone when wearing only a shirt under the coat. Is that how the coat is supposed to fit with a little extra “over hang” on the shoulders to be able to wear a sports jacket underneath? Yes, exactly. If there were no extra there, a jacket would always struggle to fit underneath. I received my bridge coat several weeks ago. I initially received a small but had to exchange for the medium, which will be perfect once I have the sleeves shortened a tad. The return process was very easy. The coat has already received lots of compliments. The sinewy curve of the buttons is striking and sets it apart. All that was expected. But the interior is really what impresses me the most. The color of the lining is perfect, and the interior pockets are more intelligently designed than any other coat I’ve ever owned. 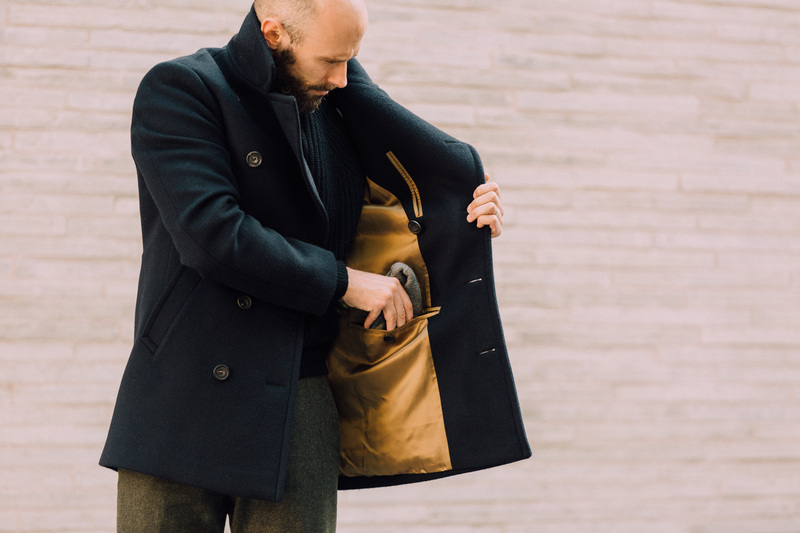 Instead of the standard interior pockets, the coat has two pockets right below the arm pits, which are easy to access when the coat is buttoned up. And the poacher’s pocket is perfect for holding leather gloves. Finally, the cashmere lining in the exterior pockets are soft to the touch and very comfy–perfect for keeping my hands warm on occasions in which it impractical to wear gloves. Congratulations. I love all the PS products I’ve purchased so far, but this one is by far the best. Really outstanding value for money. Lovely coat Simon.Hope to enjoy it for many years. 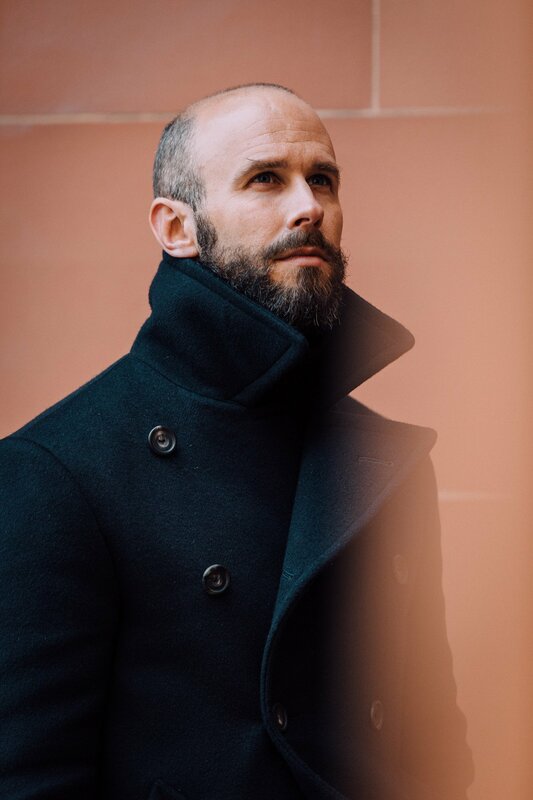 I recently came across a wool/cashmere raglan overcoat by Schneider’s of Salzburg.Excellent quality. Have you ever seen their wares at Pitti or in Milan?